We’ve added a couple of new T Shirts (the first for a while) to the VCSE store. 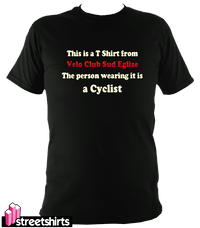 Inspired by our musical tastes, but with a velo twist (natch) there’s the Musical Influence T in black. This is a unisex cut available in sizes small thru’ 3XL. All sizes from Purito Rodriguez upwards right? Stuck for something to get drenched in sweat during your workout? Look no further than the VCSE collegiate style Work Harder T in grey marl. Same deal as before, so a unisex cut with sizes to 3XL. Full details plus pictures of that one at the VCSE store and via our Facebook page.